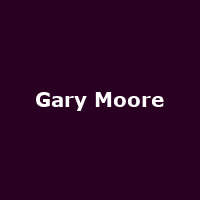 [1952 - 2011] Gary Moore was a renowned guitarist, singer and songwriter from Northern Ireland. In 1969, aged just 16, Moore joined Dublin rockers Skid Row, later beginning a long-standing working relationship with Thin Lizzy's Phil Lynott. Just a few years later saw him go solo in the 70s, releasing numerous rock and later blues/ rock albums. Hits include 'Parisienne Walkways' (featuring Phil Lynott), 'Out in the Fields' (co-written with Phil Lynott), 'Empty Rooms' and 'Still got the Blues' amongst many others. He was twice a member of Thin Lizzy, between 1973 and 1974 and 1978 and 1979.